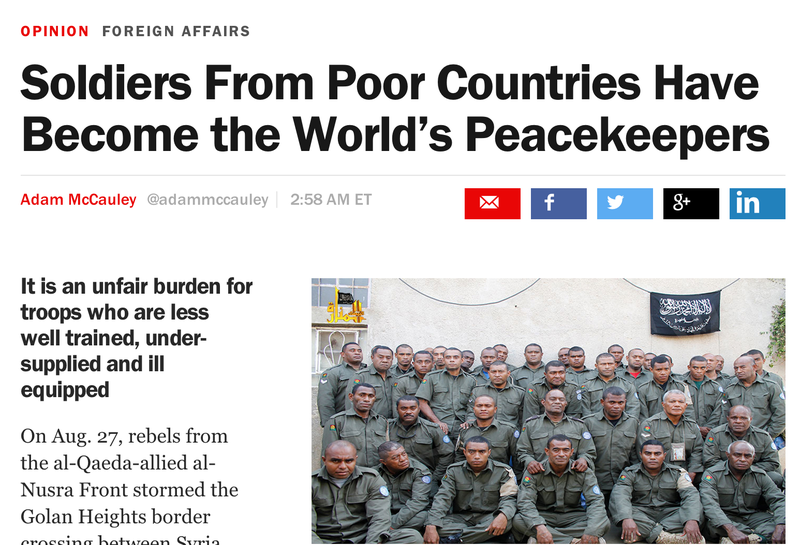 Today, peacekeepers are more apt to serve in regions where there is “no peace to keep”; where the potential belligerents are non-state actors (rebels, extremist groups, etc…) to whom the rules of international law —and the logic of deterrence— matter little; and where Western (or “developed”) countries are loathe to donate their own troops. Today, I published a short op-ed on last month’s kidnapping of 45 Fijian peacekeepers in the Golan Heights by the Al-Qaeda-linked Nusra Front. Thankfully, the Fijian peacekeepers were released yesterday, but their two week ordeal illustrates a worrying symptom of a broken system: today, peacekeepers are more apt to serve in regions where there is “no peace to keep”; where the potential belligerents are non-state actors (rebels, extremist groups, etc…) to whom the rules of international law —and the logic of deterrence— matter little; and where Western (or developed countries) loathe to donate their own troops. As a result, these blue helmets in the world’s most vulnerable conditions are primarily culled from the developing world. 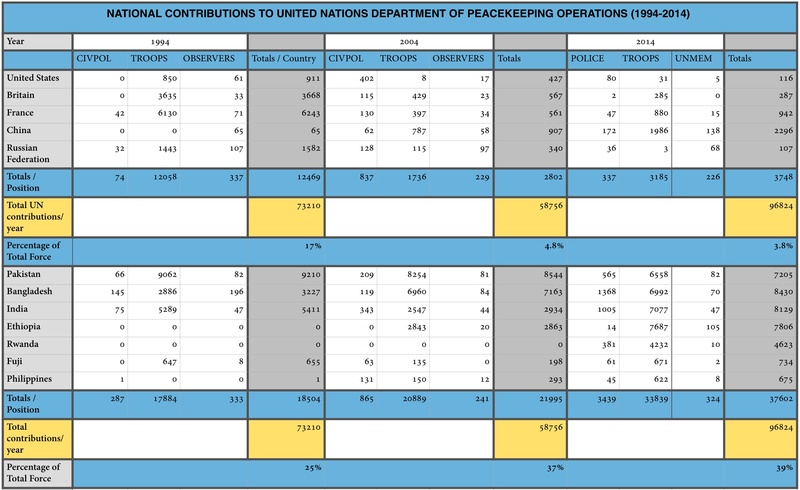 While you can read the full article here, I’ve included the compiled UN data below. One additional note, of course, is China’s increased contribution to the UN ranks, particularly during the last decade. The UN missions in Mali and South Sudan, for instance, have seen the Chinese don blue helmets with increasing frequency. For some, this willingness to deploy troops signals a growing “militarization” of their role in Africa. For others, however, their contributions note a shift in political rhetoric: once a strict proponent of state sovereignty with an acute allergy towards principles of foreign intervention, China has become more dependent on their international connections. Measures to ensure stability, then, are in line with their own political interests. But we’ll leave that debate for another day.